These three remarkably well-preserved fine Sinhalese ola manuscripts each comprise approximately 110 leaves and a pair of covers. Each page is of trimmed palm leaf with blackened edges and eight fine lines of dense Sinhalese script. 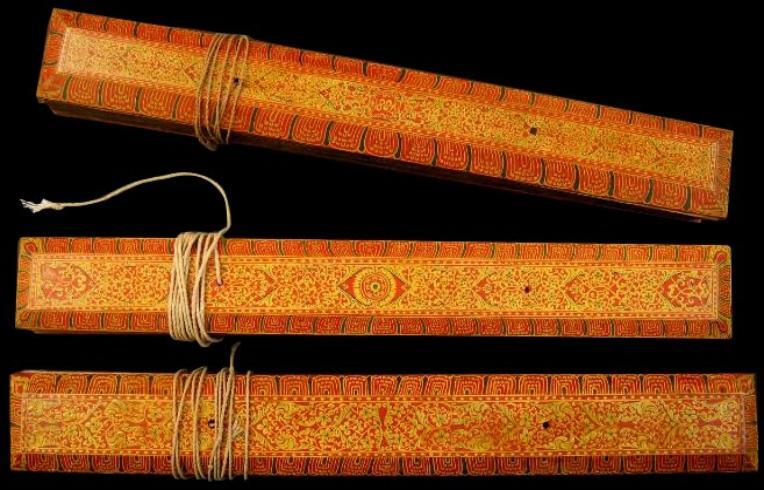 The wooden covers, with bevelled outer edges, are finely painted with lotus petal borders and floral and scrolling foliage designs in green, orange and yellow polychrome. One is dated 1881, another 1882, and the third from around the same period is undated. Each is bound with natural fibre string. The British Museum has on display a similar though less-well preserved example (cat. no. OA 1989.10-11.17). The Colombo Museum Library holds around 5,000 palm leaf manuscripts. 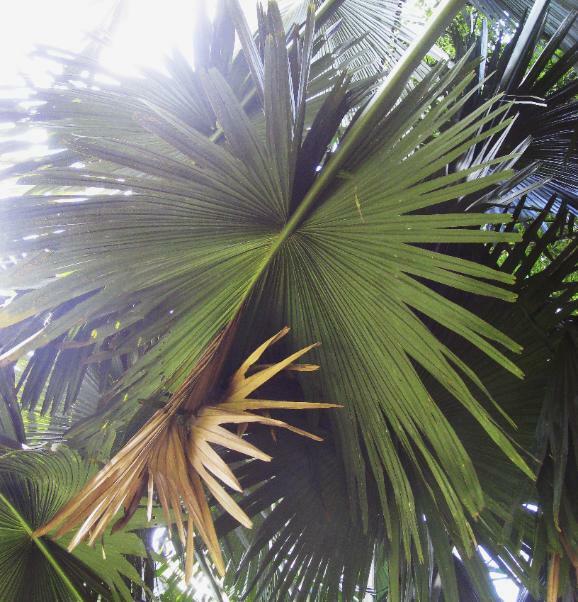 Corypha umbraculifera). 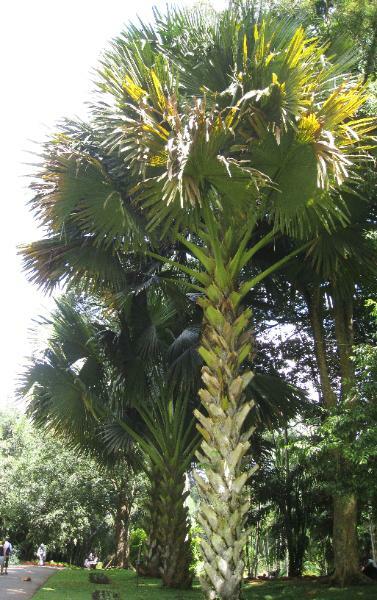 It is one of the largest palms to grow in Sri Lanka and grows to a height of 15-35 metres. The trees take 40 to 100 years to reach maturity and before the tree dies, it shoots out from its top an inflorescence that can be as long as 7 metres. The material used for preparing the writing leaf is taken from young trees and from the unopened leaf buds of such trees. Each leaf bud grows to 3 to 7 metres long and can hold up to 100 leaflets. The preparation of the writing leaf required much care. A young tree would be selected and when the leaf bud was about to burst open it was cut off and slit open. The leaflets were then separated and removed one by one. The midribs of the leaflets were removed and the leaflets were them immersed in a vessel filled with cold water. The vessel was then placed over a slow fire until the water reached boiling point. Thereafter the heat was reduced and the leaflets were allowed to simmer for several hours. The leaflets then were taken out and allowed to dry for three days in the sun. Thereafter the leaflets were exposed to the cooler night air for three nights, allowing them to become supple. The manuscript pages then were cut from the leaves. They were punched with one or two holes using a steel punch. The holes later were used in the filing of the pages – a bamboo slither was passed through a hole in each page so that all the pages could be held together. Held together, the edges of the pages were then singed with a hot iron and burnt to remove any irregularities so that each page would be of uniform length and width. 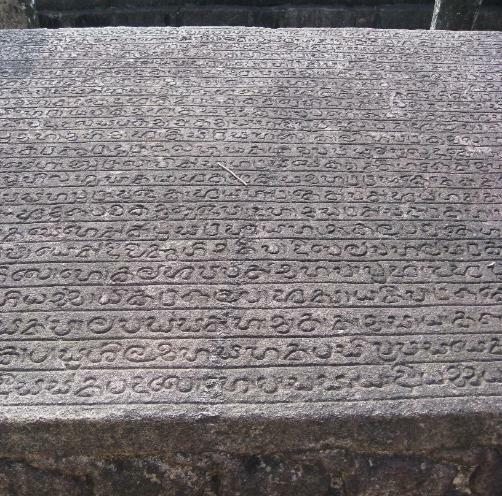 Writing on each page was done with a style that had a steel point which was sharpened from time to time on an oiled stone. The writing then had to be blackened otherwise it was too faint. This was done with ink made from combining fine dust made from charcoal from leaves, commonly cotton plant leaves, with an alluvial resin. The mixture was heated until a black resinous oil was produced. This was rubbed over the manuscript pages with a cloth so that the whole page was covered with black. This was then rubbed away with sifted rice bran, leaving the black resin in the scratched depressions left on the page by the style. Palm leaf books were not normally illustrated. Once the pages were finished, two covers were produced for them. These were made to size. 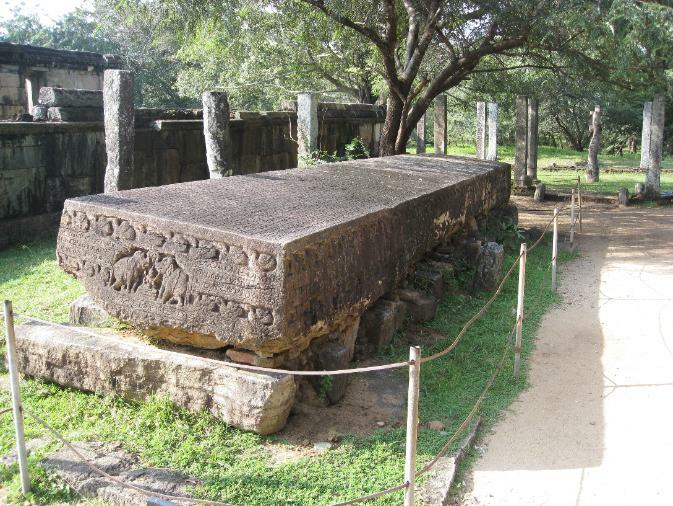 The edges almost always were bevelled and the inner and outer surfaces usually were painted, usually with colourful designs. The covers were made from one of various types of local woods such as ebony, iron wood, val sapu, gammalu, jak or milla. The leaves of the book and the covers then were strung together with a cord, either a cotton cord or one made from the fibre of the niyanda leaf. De Silva, W.A, Catalogue of Palm Leaf Manuscripts in the Library of the Colombo Museum, Volume 1, 1938. 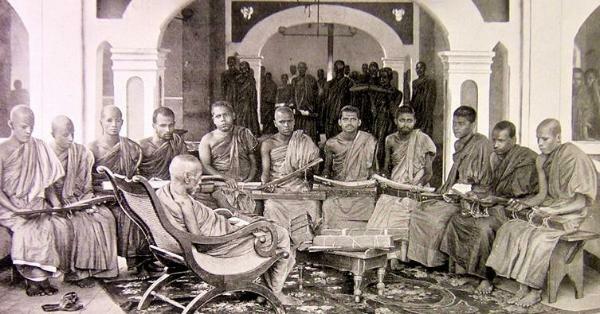 High priests reading from palm leaf books, circa 1900. Talipot palms, Kandy, central Sri Lanka. 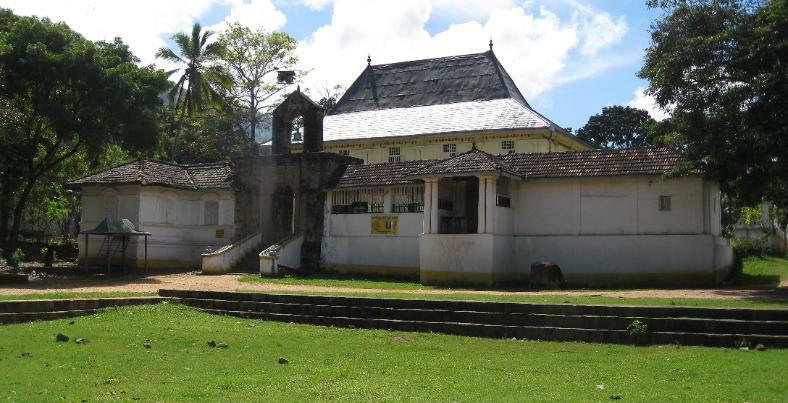 The monastery of Potgul Magila Vihara, central Sri Lanka, which holds perhaps central Sri Lanka’s most extensive collection of ola manuscripts. 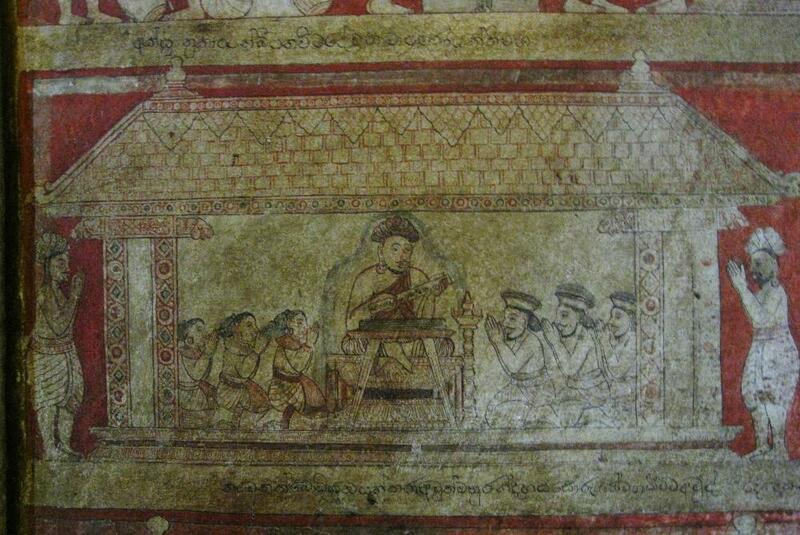 An eighteenth century cave wall painting at Degaldoruwa Temple, central Sri Lanka, which shows a Kandyan king reading from an ola manuscript. An example of the year date, as painted into a cover.